Where we regularly post helpful articles on anything automotive. Basic how-to guides, as well as relevant information on buying and maintaining a car in Northern California. We also share what's going on at Hanlees, like news, staff highlights, and more! I want to personally welcome you into the Hanlees family. We have worked hard to build this business and have found strength and resolution in our customers over the years. Acknowledging all customers with a smile and friendly attitude. Enthusiastically assisting all customers with a prompt courteous greeting in a professional manner. Escorting all customers to the location they are looking for instead of pointing in the direction. Genuinely thanking each customer for doing business with us and smiling throughout our interaction with our customers. Maintaining a professional, energetic attitude and appearance at all times providing service with a smile. Working with a smile and a positive attitude whenever working with or around our customers. We are a local and family owned business that puts those values in everything we do. We want to know what we can do to make you happy. We are constantly striving to improve and bring the best service to our customers. I would like to extend my sincerest gratitude for your patronage. 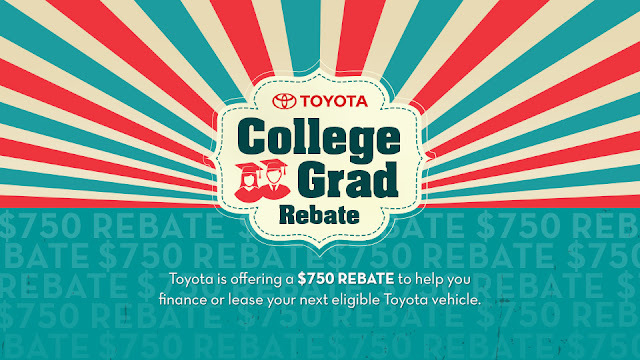 Toyota's College Grad Rebate Program for Buying a New Car! We've been a family owned and operated business for over 20 years in Northern California. We strive to bring the highest quality of service to our customers. Visit us today!